Aluminum is a popular metal used in sheet fabrication because it is such a flexible and cost-effective metal to work with. It plays hosts to a wide variety of beneficial properties and also offer a wide range of options to fabricators. Characterized by a high thermal and electrical conductivity, low mechanical properties, relatively easy workability and a high resistance to corrosion. Strain hardening can cause a moderate increase in strength, with the major impurities in this series being silicon and iron. Grades of aluminium categorized under this series includes: 1050, 1060, 1100, 1145, 1200, 1230, and 1350. Aluminium alloys categorized in this series require solution heat treatments in order to obtain their finest properties – this solution heat treatment can bring out properties that are very similar and sometimes even exceeds those of low-carbon steel. Precipitation heat treatment (or aging) an also be used to cause a further increase in mechanical properties. Though this treatment does increase yield strength, the tensile strength is not as good. Alloys categorized in this series do not have a high resistance to corrosion and, in some cases, might even be subject to inter-granular corrosion. This series is also great for parts that require a good strength at temperatures of up to 300°F (150°C). Though these alloys have a limited weldability (with the exception of grade 2219), they also have a superior machinability. The most popular grade in this series is 2024, which is most commonly used in the construction of aircraft. With an estimated 20% higher strength than series 1xxx grades of aluminum, alloys in this series are generally non-heat treatable. Up to about 1.5% of manganese can be affectively added to aluminium, making it a major element in only a few alloys. In this series, the major alloying element is silicon. It can be added in sufficient amounts of up to 12% in order to cause a lowering in the melting range. Because of this, aluminum-silicon alloys are suitable for use in welding wire. Aluminum-silicon alloys are also used as brazing alloys for joining aluminium, as a a lower melting range than that of the base metal is required for this process. When anodic oxide finishes are applied to the aluminium that contains substantial amounts of silicon, it becomes dark grey to charcoal in color. This property puts it in high demand for use in architectural applications. The characteristics of aluminium alloys in this series includes a good weldabilty and a relatively good resistance to corrosion in marine environments. Here, the major alloying element is magnesium. When magnesium is used with manganese, or as a major alloying element, the results are a moderate to high strength, work-hardenable alloy. Magnesium is a more effective hardener than manganese, with about 0.8% of magnesium being equal to 1.25% of manganese. Magnesium can also be added to aluminium in considerable amounts. In order to avoid susceptibility to stress-corrosion cracking, limitations are placed on higher-magnesium aluminium alloys in terms of the amount of cold work and the operating temperatures (150°). In this specific series, aluminium alloys contain silicon and magnesium. This silicon and magnesium content is approximate to the proportions required to form magnesium silicide (Mg2Si). This makes the aluminium alloy heat treatable. 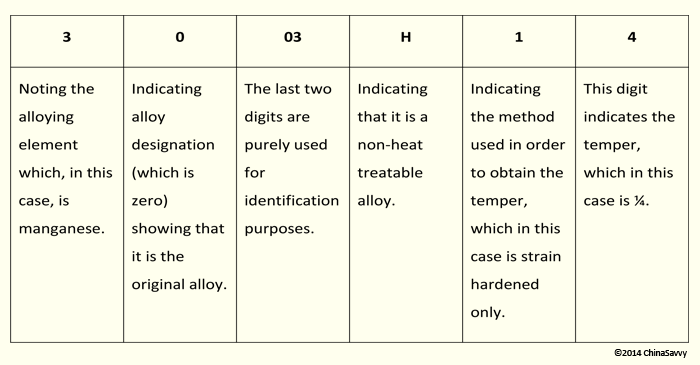 The grades of aluminum in this particular series can be formed in the T4 temper (solution heat treated) and strengthened after forming the full T6 properties (precipitation heat treatment). In this series zinc (in the amounts of 1 to 8%) is the major alloying element. When combined with a smaller amount of magnesium, aluminium in this series become heat-treatable alloys that has a moderate to high strength. Chromium and copper are also frequently added in small amounts . Used in highly stressed parts such as mobile equipment and airframe structures, higher strength 7xxx series aluminum alloys show a reduced resistance to stress corrosion cracking. These alloys are often used in a lightly over-aged temper in order to provide a better strength, a higher resistance to corrosion and toughness against fractures. This series is reserved for alloying elements other than those used in series 2xxx and series 7xxx. Nickel and iron is used to increase strength and does not cause any significant loss in electrical conductivity. This is useful in conductor alloys such as 8017. Developed for aerospace applications, aluminum-lithium alloy 8090 has an exceptionally high strength and stiffness. Commercially pure aluminium, it has a great workability, soft, malleable and is the most weldable aluminum alloy of them all. Because this alloy hardens at a slower rate than others, it is perfect for forming intricate parts as well. Non-heat treatable, susceptible to decorative finishes and with a high resistance to corrosion, this grade of aluminium is widely used in the food processing industry. The most free-machining with excellent mechanical properties, this grade is widely used in parts that need extensive machining, such as automatic screw machine parts. Widely used for automatic screw machine work, the 2017 alloy has a high strength, is malleable, has outstanding machinability and used for heavy-duty structural parts. The 2017 alloy’s strength is slightly less than that of the 2014 alloy. This alloy is used where a good strength- to- weight ratio is needed and is one of the best known high strength aluminum alloys used today. Having a high strength, an excellent resistance to fatigue, it is also readily machined to a high finish. Readily formed into the a hardened condition, it can be subsequently heat treated as well. 2024 can be flash, spot and seam welded, but arc and gas welding is not recommend. Because of 2024’s high resistance to corrosion, it is often used with an anodized finish or in clad form, in addition to a thin layer highly pure aluminium. 2024 aluminum is used in various applications in various industries for parts such as truck wheels, hardware and structural components for aircraft. The most commonly used aluminum alloy, it is commercially pure aluminum with the addition of manganese, giving it a 20% higher strength over the 1100 grade aluminium. This means that it has the great characteristics of the 1100 grade, with an increased strength. 3003 aluminium can be spun, deep drawn, welded and brazed. In addition to this, it offers great workability and a high resistance to corrosion. Non-heat treatable, 3003 grade is commonly used for decorative trims, chemical equipment, cooking utensils and storage tanks. Considered to be an ‘improved’ version of grade 3003, it showcases the same mechanical properties and characteristics, but preforms better in actual service and use. With the same applications as grade 3003, this aluminum alloy is is also well suited for anodizing and has a lesser tendency of streaking and discoloring. The highest strength alloy of the non-heat treatable grades, 5052’s fatigue strength is higher that mot of the other aluminum alloys and has an excellent workability. It also shows a higher resistance to salt water corrosion and preforms well, showing a good resistance, to marine atmospheres. 5052 alloys can be drawn and shaped into intricate pieces. It also shows a slightly greater strength in the hardened condition, minimizing tears that occur in 1100 and 3003 aluminium alloys. Used in the marine, transport and home appliance industries, it also finds applications in heavy duty cooking utensils and the equipment used for the bulk processing of food. Known as superior weldable alloys, these two grades were developed to fill the need for aluminum sheet and plate alloys for higher strength, welded applications. These two grades of alloys present good welding characteristics, a great resistance to corrosion, good design efficiency and the same economy as non-heat treatable alloys. With 5083 alloys showing a slightly higher mechanical property than 5086 alloys, this is just because of the higher manganese content present in 5083 alloys. Used in various applications, these alloys are prominent in missile containers, boat hulls, superstructures, unfired pressure vessels ad heavy-duty truck and trailer assemblies. A heat-treatable alloy, it is also the least expensive grade as well as the most versatile of all the heat-treatable alloys. Offering a range of good mechanical properties, it also offers a good resistance to corrosion. Additionally, it offers great workability in its hardened condition as well. In its T4 condition, 6061 can be subjected to fairly severe forming operations. Through artificial aging, grade 6061 can accomplish its full T6 properties. This entails that it can be welded by all methods and even furnace brazed. T6 is also available in clad form, having a thin layer of high purity aluminium on its surface, helping to improve not only its appearance, but its resistance to corrosion as well. Overall, 6061 is used where good strength is needed, resistance to corrosion is essential and the appearance (look) of the alloy is important. Used to make structural components, screw machine parts, truck bodies and frames, to name but a few examples. Developed as an extrusion alloy, 6063 is also frequently referred to as an ‘architectural alloy’. It has a high resistance to corrosion, a high tensile strength and brilliant finishing features. This aluminium alloy is best suited for plain or colored anodizing applications and can be found in interior, exterior and architectural applications. Some examples of where this aluminum alloy is used include decorative trims , windows, store fronts and doors. With an excellent strength-to-weight ratio, 7075 is the highest strength aluminum alloy available today. It can be formed in its hardened condition and can undergo subsequent heat treatment. Although gas and arc welding is not recommend for this alloy, flash and sport welding is. To improve resistance to corrosion, it is available in clad form, which only moderately affects the overall strength of the alloy. 7075 is used for applications that require high stressed parts. It is flexible enough for welding and deep drawing, but it’s strength is not as high as the other grades, such as Grade 3003-H14, available to sheet fabricators. It’s mechanical properties includes a yield strength of 17 000 psi. This grade of aluminum is also commonly used to make products such as cooking utensils, decorative parts, dials and name plates. Stronger than Grade 1100-H14, this grade is known for having the same formability as Grade 1100 aluminum as well as the same added benefit of a low cost. Corrosion resistant and weldable, it is often chosen for use in spun and drawn parts, cabinets, stampings, fan blades, mailboxes and assorted tanks. It’s mechanical properties includes a tensile strength of 22 000 psi and a yield strength of 21 000 psi. Commonly used to produce gas lines, heat exchangers, hardware used by builders, garage doors and awning slats. Though it is much stronger than Grade 3003-H14, it still offers great formability and a high resistance to corrosion. With a benefit of great weldability, products made include pressure vessels, electronic chassis and tanks. This grades has and ultimate tensile strength of 33 000 psi and a tensile yield strength of 28 000 psi. This grade is commonly used for architectural purposes as well as for sheet metal and fabrication uses. Used in modern aircraft structures, this is one of the most common heat-treated structural grades of aluminum alloy. It is much stronger than the Grade 5052, but it is not as ‘formable’ though. This grade is weldable (though it should be noted that it loses some of its strength during the welding process) and is corrosion resistant. It has an ultimate tensile strength of at least 42 000 psi and a yield strength of at least 35 000 psi. Gangways and aluminum docks are made using aluminum extrusions of this particular grade. Other parts include bicycle frames and components, baffle systems and secondary chambers used firearm sound suppressors. It is commonly used in the maritime industry and this grade of extrusion is also sometimes used in the automotive industry to create automobile frames. In line with the aluminum industry, Chinese aluminum grade allocations are up to world-standards and spesifications.